From mellow music for an intimate gathering, to a fully interactive 3-D stage show for hundreds, The Etch Man and his talented players can cover all your entertainment needs. From country standards to romantic ballads to alt-rock faves, our professional musicians can also cover just about any song in any style! Just ask! Let us ROCK your socks off! Christoph Brown is not only the Worlds Fastest Etch A Sketch Artist, he is also an accomplished singer and performer! 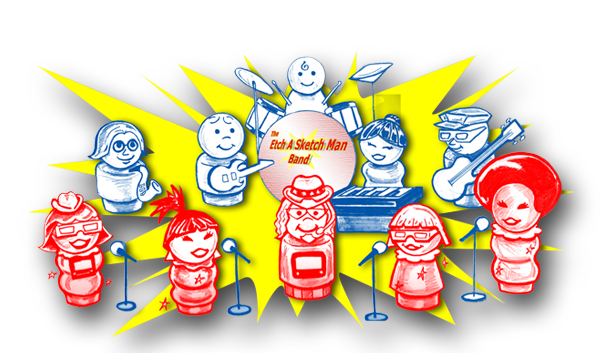 From country standards to romantic ballads to alt-rock faves, The Etch Man Band can cover just about any song in any style! THE ETCHTONES: an acoustic trio. Two guitars, three voices, sensational harmonies. THE ETCHETTES: 4 female back-up vocalists. The SKETCHETTES: 6-12 professional back-up dancers. Preserved Etch A Sketch Portraits raffled to select guests from band stage. Etch Pod projecting LIVE etching and/or Etch U videos. Set-list requests (provided by client in advance) and original Etch Man songs, music and videos. *Recommended for events with a 300+ guest count. Need even more entertainment? Ask about additional bands or comedy performances! *Especially recommended for events with a 200+ guest count.